Civil Parish or Township: Crogennant, LLANGELYNIN, a parish in the hundred of Talybont, county Merioneth, 5 miles N.W. of Towyn, and 12 S.W. of Dolgelly. Barmouth is its post town. It is situated on the coast of Cardigan Bay, and includes the townships of Bodgadfan, Crogennant, Llanfeddiged, and the large village of Llwyngwril. Also listed in the house is William Pugh 3 (Grandson of Richard Pugh) born Dongelly. 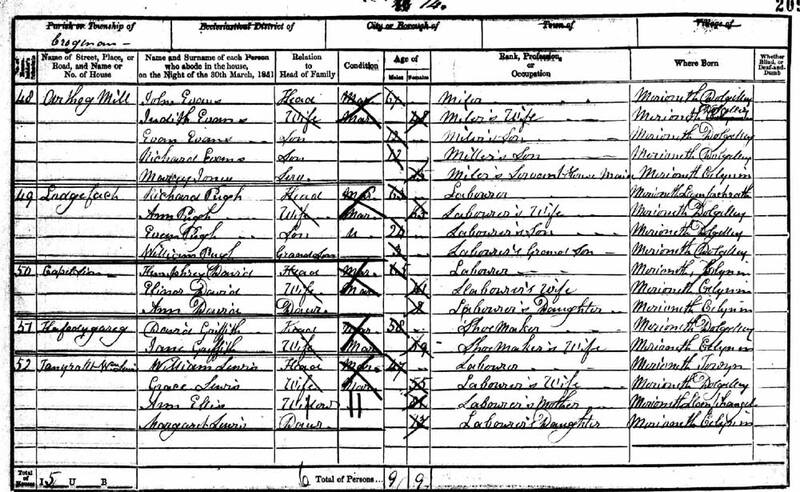 He is listed in the 1861 census as living in Corris. His mother Jane then age 37, ie born circa 1824, (born Llanfachreth) has remarried to an Edward Evans. William is the only Pugh they have in that household then.